There have been cookie-like baked goods—flat, hard wafers—for as long as there has been baking. They were easy to pack, and they generally held up to travel very well. The first such wafers didn't seem much like modern cookies, if only because they weren't very sweet. The first things that we might describe as cookies appear to have come from Persia, sometime around the 7th century. They spread fairly quickly to Europe, and made their way to the Americas in the early 17th century with the first Dutch settlers; our word "cookie" is an Anglicized version of the Dutch word "koekje." Just the name of a favorite cookie is enough to trigger happy memories. Snickerdoodle, chocolate chip, oatmeal raisin, black and white, rum ball, peanut butter, rugelach, gingerbread men—the list could go on and on. Some types of cookies are so popular that they have entire cookbooks devoted to them. Carey Jones salutes the American classic in Chocolate Chip Cookies (e-book | print); Domenica Marchetti takes on an Italian favorite in Ciao Biscotti (e-book | print), and Cecile Cannone shows you how to make the delicate French Macarons (e-book). We associate cookies with indulgence, as in Sesame Street's always-hungry Cookie Monster, and with childhood, such as the annual Girl Scout fundraising drives. In some parts of Pennsylvania and Ohio, it's traditional to have a cookie table at a wedding, as a supplement to (sometimes even as a replacement for) the wedding cake. And more than any other holiday, we associate cookies with Christmas. Many families leave cookies and milk for Santa, and there are cookie flavors that are traditional at this time of the year, such as gingerbread and peppermint. Betty Crocker offers a variety of Christmas Cookies (e-book | print); Valerie Peterson and Janice Fryer show you how to decorate your cookies in Cookie Craft Christmas (e-book), and Gina Hyams helps you to plan a Christmas Cookie Contest (e-book). The desire to have lots of cookies on hand for the holidays has led to a new tradition in recent years. For a cookie swap, friends and neighbors each bake a large batch of their favorite cookie, then gather to exchange small batches. 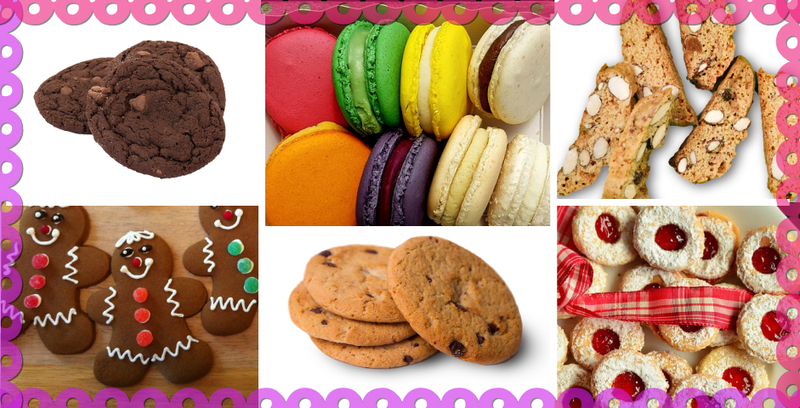 Bring ten dozen of your best recipe; leave with ten dozen assorted cookies to see you through the season. Two different cookbooks called Cookie Swap offer recipes and hints for organizing a successful exchange; they're written by Julia M. Usher (e-book | print) and Lauren Chattman (e-book | print). Of course, cookies aren't only for the holidays. There's a reason to bake a cookie any day of the year, as Anna Ginsberg proves in The Daily Cookie (e-book | print), which offers a holiday, commemorative event, or bit of trivia for each day, along with a related cookie recipe. Cookies aren't always the healthiest food. These days, even Cookie Monster acknowledges that cookies are a "sometimes food." But when you're in the mood to indulge, some cookbooks dive straight into the decadent side of cookies. Alice Medrich's Chewy Gooey Crispy Crunchy (e-book | print) leaves nothing to the imagination, and Judy Rosenberg's Chocolate-Packed, Jam-Filled, Butter-Rich, No-Holds-Barred Cookie Book (e-book | print) sounds even naughtier. But cookies can be—well, maybe not good for you, but at least not quite so horrifyingly bad. For healthier cookies, you might enjoy John Chatham's Paleo Cookies (e-book), Isa Chandra Moskowitz & Terry Hope Romero's Vegan Cookies (e-book), or Luane Kohnke's Gluten-Free Cookies (e-book | print). For the novice baker looking for an easier entry to cookie making, Camilla Saulsbury's The Ultimate Shortcut Cookie Book (e-book | print) offers recipes that start with packaged brownie mix or refrigerated cookie dough. If that still seems intimidating, Christi Farr Johnstone's Smart Cookie (e-book | print) provides decorating tips to turn your store-bought cookies into robots, ladybugs, or other attractive treats. Mary, Queen of Scots was born. Mary became Queen of Scotland at six days old, upon the death of her father, James V. Regents ruled the country during her childhood; after she reached adulthood, she ruled for only a few years before she was forced to abdicate by political rivals. She fled to England, hoping for support from her cousin, Queen Elizabeth I, but Elizabeth saw her as a potential claimant to the English throne, and held Mary prisoner for eighteen years. In 1586, Mary was convicted of attempting to assassinate Elizabeth, and she was beheaded in 1587. John Guy's Queen of Scots (e-book | e-audio | print) is a thorough biography of Mary. Willa Cather was born. Cather was a popular author of the 1910s and 1920s whose books are still read today. Her novels frequently focused on the lives of immigrants in the Midwest, something of a novelty at the time, when most American literature focused on the social elite of New England and New York. Cather's most popular novels include O Pioneers! (e-book | e-audio | print | audio) and My Antonia (e-book | e-audio | print | audio); she received the Pulitzer Prize in 1923 for the World War I novel One of Ours (e-book | e-audio | print). Walt Disney was born. Disney was an animator and film producer whose characters have become American icons, recognized around the world. He introduced a variety of new innovations to animation—sound, Technicolor, feature-length films—and was the original voice of Mickey Mouse. As a producer, Disney won 22 Academy Awards, more than any other individual. Neal Gabler's 2006 biography, Walt Disney: The Triumph of the American Imagination (e-book | e-audio | print | audio), won the Los Angeles Times Book Prize for Biography. The Altamont Free Concert was held at Altamont Speedway in Tracy, California. The concert was poorly organized, and things went badly from the beginning. The Speedway wasn't chosen as the venue until two nights before the concert. The small stage sat at the bottom of a slope, with no barriers separating it from the audience. The local Hells Angels were asked to provide minimal security—basically, just to keep the audience off the stage, for which they would be paid in free beer for the day. By the end of the day, the Angels and the crowd were mostly drunk, and the crowd was angry that the Rolling Stones' appearance had been delayed. An audience member who tried to get onto the stage was fatally stabbed by one of the Hells Angels. Saul Austerlitz tells the story of Altamont in Just a Shot Away (e-book | print).